Thank you for the great review Patrick! It really means a lot when a client of ours goes out of their way to put in a good word about our services! Enjoy your summer! Thanks for the great review Bev! We appreciate you taking the time to show us your love. It was a pleasure working with you! Enjoy your summer! Thanks for the kind words Kimberly! We appreciate you taking the time to share your experience with us! Hope you have a wonderful summer! 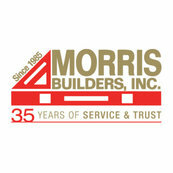 Morris Builders are consummate professionals that offers the full package - amazing design and craftsmanship.